Discussion in 'The Story' started by Marina Giulestei, Nov 4, 2018. Even after her mind was cleared from the shadow of the Sith Warmaster, her search for peace had left one clear impression in her mind: Ruusan. She knew the place not well, but felt its power in her life, the place where her former master had perished. He, and so many others that day, that had finally triggered the Sith Empire's wholesale assault upon the Order. Perhaps she ought to curse him. Vollen and the rest, whatever had happened there had set off more suffering than they might ever know. And yet, in her heart she could not. All she felt was a pain, a mourning for them. And a need to finally set down there, set it to rest. From what she understood, none had returned to the site that the skirmish had taken place. Not since that day. And as she and her companions, Masters Wolfe and Vult, those who had saved her on Tython, drew closer to its location she could feel exactly why. The Force seemed twisted here, distorted, as if the world wanted to fall in upon itself. They had needed no navigation beacons, so powerful was the wound. It rippled in the waters, shook within the air. And rang in her mind, a small hum in the back of her head. What they might find there she couldn't be certain. But there was only one thing she meant to find. It was not long after the two Jedi Masters had gathered the supplies they knew they would need for the Deep Stone Crypt — for now, they could do little more until its construction was completed and the corridors of the sanctuary were carved out of the depths of the mountain on Ellora. Until then, they had been asked by Marina Giulestei to accompany her as she traveled to Ruusan. Gladly accepting, Austin Wolfe and Galahad Vult now stood beside her as the path to the Wound in the Force lay some distance before them. Her mind was now intact — repaired by the help of meditation, counsel, and focus in the Light. This much Austin could sense, though they had spoken little until now. Though this world should have been alive with fauna, the sounds of birds and other wildlife resounding through the trees and over the hills, it was deathly silent. The very air felt thin, as if each breath was stolen away by some unseen fiend. More than this, the feeling of corruption and taint that only those awoken in the Force could sense was thick upon Ruusan. They would find little here other than an icy chill and the stench of death. "I do not know what we shall find here," Austin spoke, his voice low as though he would alert some deceased monstrosity if he breathed too loud. "Aside from ruin and death. But we must put to rest the Jedi who fell here — we can be sure the Empress did no such thing." Looking to his side where Marina stood, he inquired of her, "I sense you seek something else here, though I would not set your hopes high. It is likely the survivors went to great lengths to blot out the existence of the Jedi." Masters Wolfe and Vult had been hard at work ever since the attack on Tython, jumping all over the system and preparing for the Long Slow Whisper. Their work mostly complete, Knight Marina Giulestei requested for them to assist her on her journey to Ruusan. Having assisted her when she was afflicted by the fear instilled in her mind by the Warmaster, Galahad was pleased to see that she had recovered well and was determined to serve the Order even as it was beset on all sides. Though there was little time to rejoice the restoration of her mind, the ex-guard was glad to aid Marina in her endeavours. As the trio crested the ridge, an awful sight lay before them. The land stretched out beneath them into what was once a large grassy field that teemed with animal and plant life. Now, all that remained was the ground, charred black from the terrible inferno that raged in the wake of the Empress' wrath. Even though the fires had long since gone out, pockets of the dark earth still emitted plumes of smoke that rose high into the air and permanently blotted out the light of the sun. Even without sensing the darkness that lingered there in the Force, it was not an unwelcoming place, and Felwinter shrank back on Galahad's shoulder in unease. Despite the presence of the Force Wound and the ever-present weight of the Dark Side, Galahad was confident in Knight Giulestei's judgment. Looking across at the doctor, Galahad grinned slightly in spite of the gravity of the situation. "Let us hope you are not afflicted with a psychometric vision today, Austin," he commented half-jokingly. "I believe it would be far more unpleasant than usual, if so." Nightfall and Vosrik like this. She almost went to reply at Austin's words as Galahad cracked in with a joke. It paused her in her tracks. A smile, a smirk. Such was enough to lift the darkness at any time, at the pair had exceeded in doing that for her thus far. However, if there could be something that would lift the damn malaise from the old battlefield before them that might have been better, shake off the smoke that drifted about before them and blocked the sun from its fields. There had been so much death here, more than she wanted to recognise. "I'd dare say let's hope none of us come away with anything we shouldn't" she piped up, following Galahad "Bad luck and all that" she said with a wink. Keep the mood light. Keep the thoughts at bay. It would have to do, shield herself with an armour of faith in the force. She was back here for a reason, she would find it soon. Voices, suddenly about her, words rippling through the air like water on rock, lapping past their ears, as if heavy, bound to the earth. Not all things here was as lifeless as they seemed apparently. But they did not hamper her steps. Even as she ventured further into the battlefield, moving toward its confluence, the centre of the force wound here, the spirits merely continued their drones, seemingly undisturbed by their presence. Perhaps they even expected it. Shalken and Vosrik like this. Revulsion and a hint of sadness welled up inside Austin involuntarily upon crossing the ridge and beholding the devastation that lay before the Jedi. Out of the black ruination that lay before them, it was possible to make out the shapes that were likely the remains of each Jedi who fell here on Ruusan at the hands of the Sith. It was then Galahad commented on Austin's psychometric abilities, and at that the doctor exhaled sharply and nodded slightly in agreement. Psychometry was indeed a rare ability among Force Sensitives, although the Jedi Master found it was immensely unpleasant. However, he could not deny that the visions certainly gave himself and Galahad immense insight in their journeys previously. Although such memories would be painful, perhaps he could grant them all knowledge of the fallen Jedi's last words. But even as they approached, whispers filled the air. Whispers of the dead, or something worse. Though at first like light ripples on a waterbed, they grew stronger and stronger as the Jedi drew closer to the centerpoint of the Force Wound. Their surroundings distorted around them as the strength of the Sith's onslaught had rent open the fabric of reality itself. "Be on your guard," Austin warned, drawing closer to their destination nonetheless. It was then that a spirit rose from the ground as mist from a lake on a cool morning, taking shape as a grotesque face marred by blood and scorch marks. * Beholding its horrific form, Austin recognized it as one of those he tended to on Jedha many years ago. Or at least, tried tending to. It rose up, its disembodied face rushing angrily towards the doctor. Its voice cried out in outrage and agony, mimicking the state upon which the person died so long ago. A clawed hand formed from the spirit, reaching out as if to tear apart the Jedi in its rage. Austin scowled as old wounds from the past came to haunt him, quite literally. As a doctor, there were always those who were too far gone to be saved. This had been one such patient, their body scorched and ravaged by the same explosion that had wounded Galahad's leg. They died shortly after having been brought before the doctor. Austin exhaled, allowing the calmness of the Force to flow through him. "Begone, spirit." he commanded, not halting his advance. "It was your time to pass. Such is the will of the Force." At these words, the spirit seemingly lost its strength and diminished into the same mist that surrounded them. This was likely far from the last thing that would assail the trio. Though no living thing stirred in the scorched fields, it seemed the Force Tear did not grant the dead the same luxury. Galahad tread lightly as they advanced deeper towards the rift, keeping his guard up at all times. Unlike corporeal foes, these souls were not bound by the usual laws of reality, and there was no telling whether they could inflict physical harm or not. The presence of the Jedi caused voices to stir, whispering softly as if from all directions at once. The hair on Master Vult's neck stood on end, but then there was silence. Resolving himself, the trio pressed on; haunting words alone would not stop the Jedi from reaching their goal. Drawing near to the Force Wound, Galahad could feel the icy cold ripples of energy emanating from it. Where nexuses of the Light took the shape of trees and other natural manifestations of life and growth, Dark Side nexuses were wholly unnatural, created only by the most awful atrocities committed or great exertions of power by those consumed by darkness. Having drawn close to this emanation of evil, a soul manifested itself before the three Jedi. Though his face was horrifically marred by grisly burns and deep gashes, Galahad still recognized the man as one of the pilots in the hangar bay when it was destroyed. He had not perished immediately like Grandmaster Cadef Sige, but he died shortly afterward in the infirmary, his wounds too severe for the doctors to heal. Howling in rage, it screamed its accusations at Doctor Wolfe before rushing towards him, reaching out as if to tear him asunder. Though the harrowing projection was enough to make any mere human quail in fear, Master Wolfe stood his ground, bidding the spirit be gone. Austin remained a beacon in the Force, constantly emanating the Light Side. As quickly it had appeared, the ghost faded away, unable to persist in the face of such unwavering faith. Now at the epicenter of the great calamity that befell the field, Galahad kept his senses sharp. Felwinter clung to his shoulder, his teeth bared in a low snarl. The ex-guard turned his gaze towards the ground, a layer of ash and cooled embers coating the earth and blackening his boots. "Whatever remains here may be buried underneath several inches of soot and debris," Galahad remarked. Seeing several wisps of ethereal smoke drifting about, the bearded Jedi watched them carefully in case they suddenly grew aggressive and attacked the trio. For now, they merely drifted about aimlessly in the air, muttering incoherently as if searching for something. * Galahad gripped his staff tighter. "Do what you must, Marina. Austin and I will protect you until you have found what it is you search for." Though the Jedi Master still was not entirely sure how to defend against incorporeal attacks, he was determined to find a way. No Jedi would die in the former temple guard's presence. With her hands lightly outstretched she let part of herself feel the force around her. Though she could sense the wound, the violence that it seemed to encapsulate in the world, that was not what she meant to find. Even as Doctor Wolfe held his ground at the more aggressive manifestations appeared before he and Galahad, Marina almost drifted further away, pacing further toward the centre. Burnt, twisted, and dying, as if caught like a cancer on the world, the ground before them was no place for living things, not even Jedi like themselves who might hope to withstand its effects. Whether her heart and stomach could face what she saw next, she wasn't so certain. In the centre of the field was a pile of ash, still bellowing smoke high into Ruusans atmosphere. There. That was it. The centre of the wound. The centre of power. "I won't be long, I promise" she offered, not looking back. Instead, she closed her eyes and reached out toward the intensity at the centre. Toward the fallen ashes of her friends. "I'm lost Marina. I am sorry to admit it, but I am. Though seeing you here... well, it's good to know I did atleast some good in this galaxy" there was a smile at the end of that sentence, a contented one, even if it couldn't be seen. He sounded older, as if fallen into some timeless place "As to where I am. You know. You don't need me for that"
"The Jedi need you though, can't you-"
"May the Force be with you Master"
"Masters" she called back to the pair "Let's go home"
For the time being, the only sound that reached the Jedi's ears was the low growling of the Arkanian Dragon perched on Galahad's shoulder. Although the mists swirled around them and the Force Wound pulsed with dark energy, nothing more came to assault them. * It was as though the presence of the three Jedi, so powerful as they were in the Light, that the shadows could not raise a finger against them. As Marina stepped forward to survey the resting place of her former master, Austin stayed vigilant and his eyes darted from place to place, watchful of anything that would seek to harm the Jedi. He gripped the binding of Caladglær strapped firmly to his side as it always was. In times of suspense such as this, the book was comforting and a symbol of strength for the doctor. A pulse rushed outward from the rip in the fabric of reality. The hairs raised on the back of the Jedi Master's neck as he turned to face it, seeing the mists swirl around threateningly. Drawing the Force to his fingertips, Austin prepared for the worst, but was met with something he did not expect. A great beast began to take shape, dark energies converging into a foul thing that would then seek to destroy the Jedi — but a bright flash of light appeared and reduced the creature's visage to nothing but dust. The light did not disappear, but grew stronger and began to take shape. Austin did not lower his defense, although he could sense that this thing that formed before him was not malevolent — in fact, it felt almost familiar. Whatever this presence was, the doctor had come in contact with it before. The form took shape, a being of pure Light. Austin stood in awe, realizing that what stood before him now was a Force Ghost — though he could not discern who it was. "Who are you?" he asked, beholding the white-blue spirit that stood in stark contrast to the black and grey remains of Ruusan. It did not answer, simply stepping closer to the Jedi Master until it was only a few feet away. Only then did its face take shape, the silvery mist receding to reveal two great eyes set within a circular, beaked face. Peering closer, the doctor answered his own question breathlessly. "...Saeros?" The two eyes blinked and nodded in affirmation. "You are not the same man I first met on Jedha — scared, faithless, and holding pain close to his heart," Saeros spoke, his ethereal voice bringing a strange warmth to the chilling air. Immediately, Austin's mind was filled with the memory of the vision he'd seen in the crystal caves deep beneath the Temple on Jedha, when it still stood. He had been there that day with Telunaris, Venatus, and Tynian when the doctor was struck with the realization that he was still holding on to his sister's death on Ilum so long ago. "Indeed, I have grown since that day," Austin replied. Though he did not say it aloud, that was the turning point of the doctor's life where he truly understood what it meant to be a Jedi. Yet Saeros seemed to understand this, his ghost stepping soundlessly on the ash-covered ground and leaving no footprints in his wake. "You have become a better Jedi than I ever could have," the Rishii replied, his eyes trailing down to the book strapped firmly to Austin's side. A twinkle of satisfaction and happiness shone in the Jedi Shadow's eyes as he beheld his former book. "Alae! You have finished my work. I am most pleased." The doctor unstrapped the tome, holding it before him as the spirit placed a ghostly hand on its cover. "You have done well, Master Wolfe. May your deeds be fruitful and blessed." Peering sideways, the great eyes of the Rishii rested upon Galahad, holding the sturdy Brylark staff. "I see my staff has served you well, Master Vult. May it continue to do so for the rest of your days." 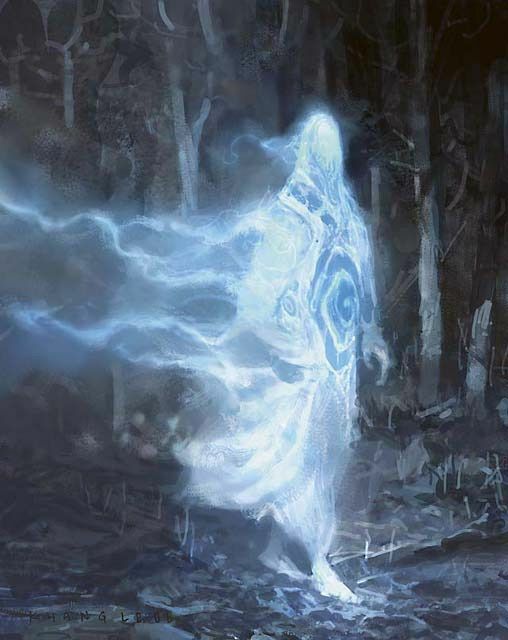 Returning Caladglær to Austin, Saeros stepped away, blue-white mists seeping away as his form began to dissipate. "Saeros —" the doctor interjected, causing the Jedi Shadow's head to swivel even as his form continued to disperse. "Will the Jedi survive the onslaught of the Empire?" The Rishii looked as though he smiled back, the wind carrying more of the Force Ghost away with it. "There will always be a Jedi, Master Wolfe. Vanya sulie, and may the Force be with you." With that, the visage of Saeros was gone, and Austin knew in his heart that the Shadow had truly become one with the Force — his work in the Galaxy now complete. Turning to face Marina, whether she had seen any of the discussion or not, he nodded in response. "Yes, let us return." Galahad took his place nearby Austin, not too far away from Marina in order to protect her if need be but not too close so as to disturb her. Several moments of eerie, unnatural silence passed as the ex-temple guard stood, prepared to strike out at anything that would dare try to harm his fellow Jedi. Though he never saw or heard anything, for a few moments Galahad could feel a familiar presence, one that reminded him of Councillor Vollen himself. Unfortunately, Master Vult never knew the man well enough to be sure, but it was a comforting thought nonetheless. However, Doctor Wolfe suddenly tensed, building the Force and preparing to attack. "I sense it too," Galahad rumbled, gripping his staff and also gathering energy as a cold, dark presence began to coalesce before them. The darkness shaped itself into a massive creature not unlike the alpha Nexu they faced not so long ago, a guttural, vicious growl emanating deep from within its unnatural throat. Before it could completely appear, it suddenly vanished as a blinding light banished it from existence. Keeping his defensive position, it quickly became clear that this new presence did not have evil intent for the Jedi. As it grew in strength and finally materialized, Galahad stared in awe, witnessing a real Force Ghost for the first time. Though he did not recognize who the apparition was, the realization dawned upon him when Master Wolfe apparently did, calling out the Jedi spirit's name. This was Saeros, the very Jedi that had written the first many chapters of Caladglær and stood in defense of the Order against the Jedi Exiles in the early days before the Sith Empire. Austin and Saeros exchanged many words of encouragement, and though it was apparent the two had met somehow previously, Galahad was not aware of the specifics — Austin had never spoken of the incident. Perhaps the doctor would be willing to divulge the events of that day in the future, if he was willing. Saeros then turned his gaze across to Galahad, eyeing the staff he held and balanced his weight upon. Bowing, Master Vult replied reverently, "I am grateful, Saeros. It has not failed me yet." With final words of comfort and farewells said, Galahad looked back to Marina, her communion with her old master now complete. "I hope you found what it was you were looking for," the bearded Jedi remarked. In a way, the two Masters had found something as well — something they certainly were not expecting. But now their work was complete, and it was time to lay the dead to rest. If times were different, the ex-guard would have wanted to cleanse the world of its Dark Side taint; but dark days lay ahead of them, and the Jedi needed to prepare if they were to survive the oncoming storm. "The will of the Force is not one found solely inside oneself..." Marina spoke the words into the holo-recorder, her voice steady. Sunlight spiralled into her chambers aboard Brighthome, the starlight illuminating her more completely then any false one might do. Though it bathed her in her embrace, the dark that had been left upon her by the Sith Warmaster... it would never truly heal. While no taint remained to draw her into madness, there was of all things, a hole. A lack, a wound in her psyche that could seemingly not knit itself back together. Even with the assistance of Masters, some things might only heal with time. And such times as they lived in now she wasn't even sure she could hope for that. "It is not the self, nor any point within the galaxy, no nexus, no object..." She had found it quietly, tucked within his lodgings the Jedi Order had yet to clear out as it readied itself to go into hiding. A discrete little box, hidden away, hours of recordings, of thoughts, theories, wisdom, and wit with aphoristic elegance seemingly forgotten, incomplete. In the time since Ruusan she had watched them all, slowly but surely, the last piece of her lost Master, speaking to her once more through the grave, through the Force. If he had peace now in whatever life lay within the Force after death, this would put him to rest in her mind. "Their is only the relation between them and the whole, feeding back in on itself. We cannot see the beauty from where we might stand, nor how to reveal it if it be veiled in darkness. But the light of the Force illuminates all, if we're only able to see"
With a click the recording ended. Another tap, a draw opened within the machine, inside which she rested the twin kyber crystals she'd recovered from the battlefield of Ruusan. They still hummed with the Force, lingering after their expulsion, like the pain in her mind. But they would carry on, as she would. Closing the draw, Marina took up the holo-recorder. The collection she now dubbed On Nature and Learning was complete. It would go with her into the West, to the ends of her days.